To Thank Those of you who are sending them in for us!! I am shamefully behind in sending out our Hand Written Thank you’s! 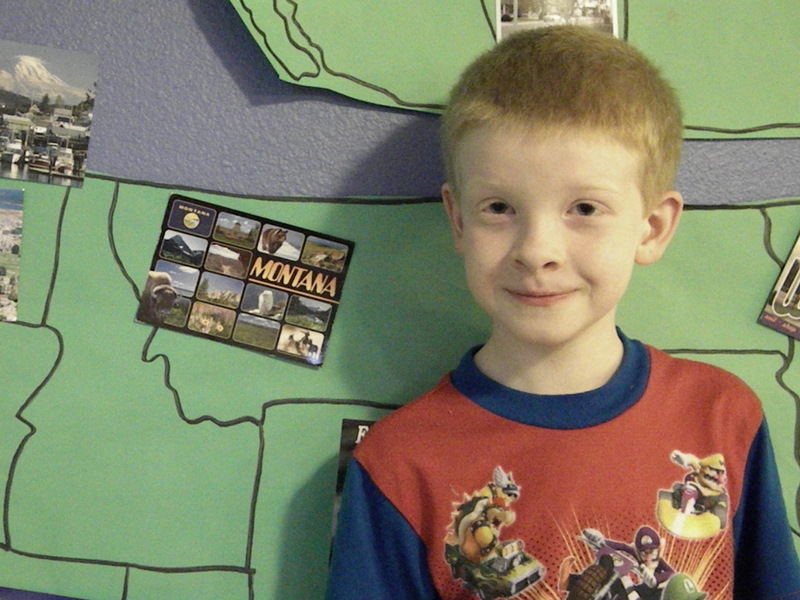 I happened upon in it January ~ just as the kids started learning about the 50 States. 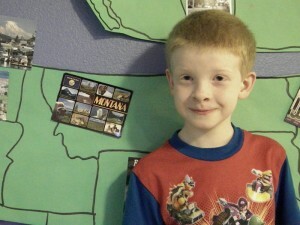 Since my kiddos daddy is Canadian ~ which makes them 1/2 Canadian =) naturally! We are collecting all Canadian Provinces too!! and about 10 from overseas as well! So we added a Continent Map ~ we still need to label this one! 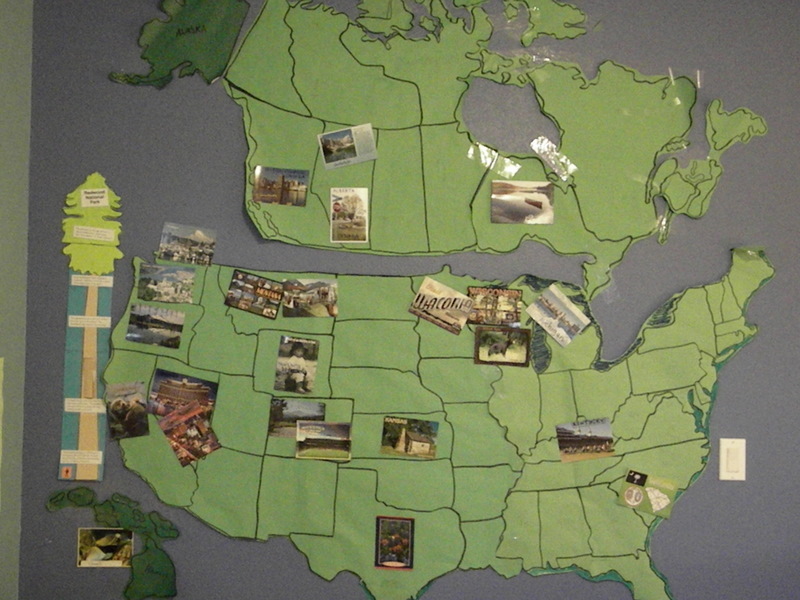 The kids find the State, Province, Country or Continent where the post cards arrive from and then we study fun facts about each one ~ we are all having a wonderful time with this project and will continue with it through the summer!! Have I mentioned I have a head cold ?? 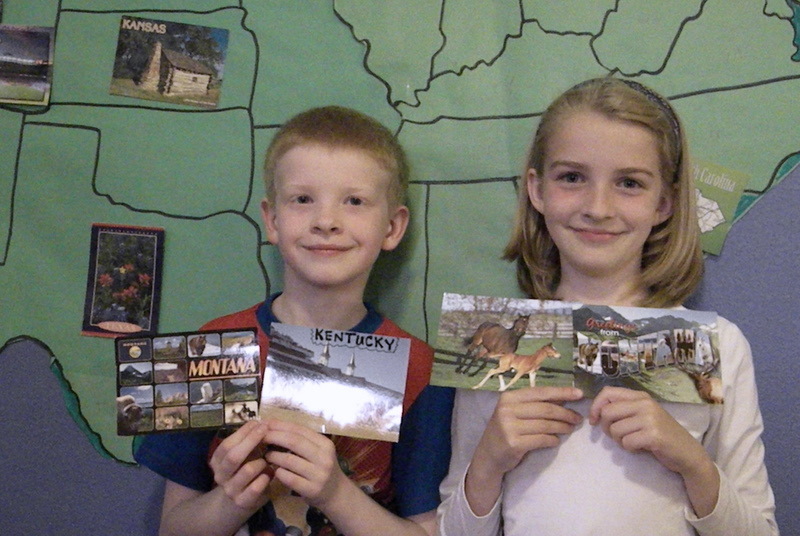 Mr. Mailman has brought us a few more Post Cards recently ~ Yippie !!! These two little monkeys LOVE getting them in the mail! Abby sent us fun Horse postcards from Kentucky ~ My daughter Abby was especially thrilled b/c it came from an Abby and she loves horses!! We enjoyed the fun facts she listed on the back! Julie M. from The Little Red Shop is currently on a fabulous road trip with her mom I believe =) When she was in Montana ~ she sent us a postcard! Bless You Julie! Julie has a passion for all things vintage and all things lovely like flowers, old houses and beautiful mountains! She is far ahead of me on vintage Savvy~ness and I love visiting her at The Little Red Shop! She also loves kittys! =) Thank You Julie M.!! 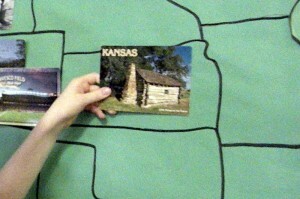 from Kansas!! They visited the Little House on the Prairie cabin ~ fun fun! Oh the memories of Laura and all her mischief from the show and the books!! This location is on my “one day I will visit” list ! I tried to introduce my little girl to Little House a while back and she just wasn’t that into it ~ maybe this year she will have a heart for Laura?!! 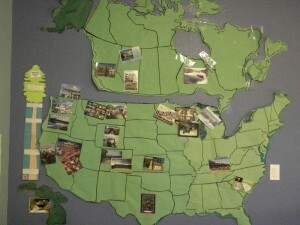 Special thanks to our friends Emma, Annie and Ellie for contributing to our Map!! Did you know there is a Wizard of Oz Museum in Wamego KS?? I just learned that ~ I guess we will have to stop there when we go visit Laura’s cabin! Just leave me a comment and I will send you our snail mail address! Thankful, blissful, thrilled, delighted, happy…. We might ~ maybe ~ drive there this summer and camp in the Red Wood Forest! What National Landmarks have you visited?? by sending you a special Four Leaf Clover we handpicked from our back yard!! speaking of … I have a few to send out today! 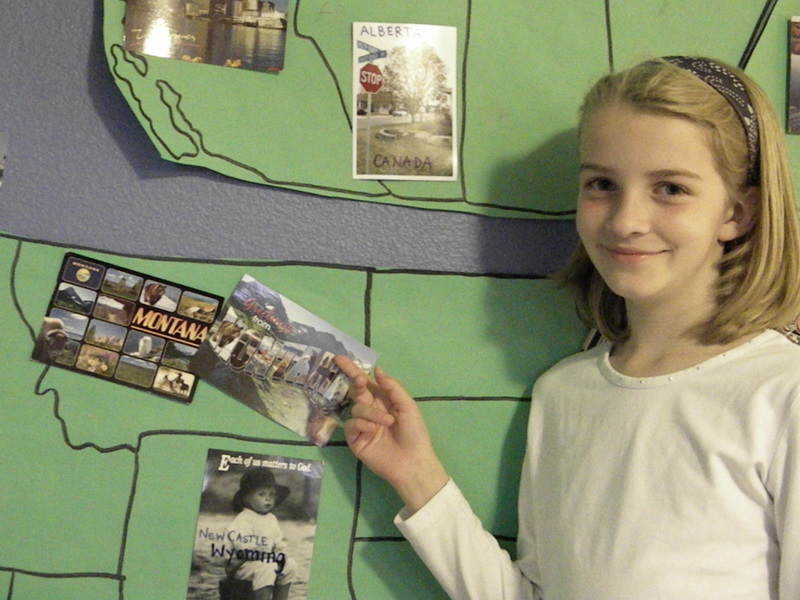 I love that your kids are learning so much about the states as they come in from the mail. We too are doing this very thing but the response hasn’t been as well received as yours but we are grateful for what we have gotten so far. Thanks for the shout out:) I’m so glad the kids like the cards! I could barely decide between all of the beautiful horse post cards. (The college I attended here actually had a horseback riding class for a PE credit! I sure did take it!) Thanks also for the kind words! I’m so glad we “met” in this blogland! You really do get to feel like you become friends with bloggy people! Hee hee. 🙂 I had no idea there was a little house on the prairie cabin in real life, that is something I’d love to see too. I love that you are doing this SO much! 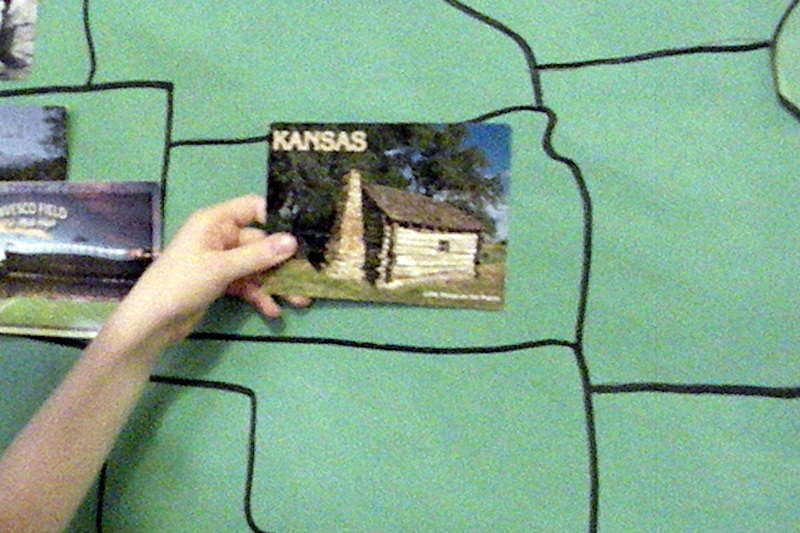 I have two cards coming to them in your June package…one from GA (us) and one from FL (a good friend). What a fun project. I am in So Cal, so if you need one from that area – Disneyland to be exact, let me know. Looks like you still need Ohio…I can make it happen. Send me your address and I’ll get it off to you! Great idea … what a good mommy you are! I’m sure your kids will remember this for a long time. ;0) Looks like you’re missing Florida. I can send you that one! Fun! we have been to the redwood forest and it’s gorgeous, i highly recommend it! I’m so sorry I forgot about this! I hope I still have your address. My last day of school is Monday. I’m writing a post it note now! That is so neat. Please let me know if you need one from Michigan. It looks like you might already have one from there let me know. I would love to send one. 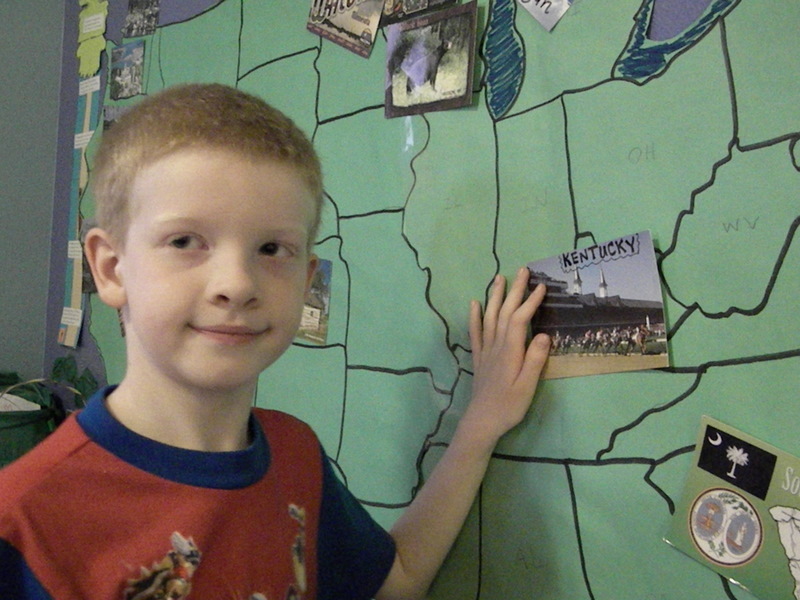 I am offering Ohio again…this time I am leaving my e-mail address for you, in case it doesn’t show up. Please e-mail me your address. I will also be traveling to Indiana next week and will look for one while I’m there! Send your mailing address to: Beth_Sherman@hotmail.com and I’ll get those to you asap! What a cool project! WoW! Looks like you need one from Virginia? I will send one. Tell me where. Saying hi from SITS! Happy Saturday. What a fun idea. Looks like you already have California or I’d be glad to help out! What a cool project! My girls and I would love to send you postcard from the Sunshine State, aka Florida! Where do I fin your address?